Mother Earth® Coco + Perlite Mix is an RHP Certified natural plant growth media that is a great alternative to potting soil and other traditional growing medias. Coconut coir is 100% natural, made from the fiber of coconut husks and is an alternative to peat based Medias. 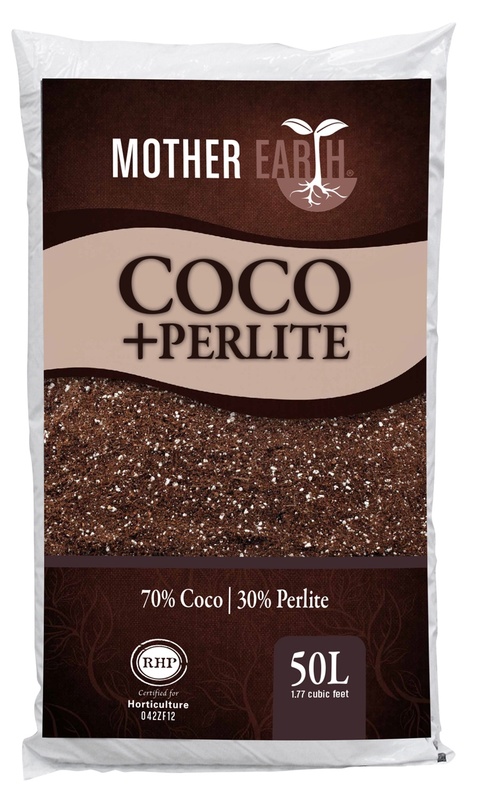 Mother Earth® Coco + Perlite incorporates 70% of the finest coco pith and fiber blend as well as 30% perlite for better aeration and drainage. Increased aeration and more drainage allow gardeners to more aggressively feed without worrying about over watering. With its unsurpassed texture, porosity and high cation-exchange capacity, Mother Earth® Coco + Perlite creates the perfect growing environment.